Posted October 2nd, 2015 by Uniting Presbyterian Church in Southern Africa & filed under Month of Mission 2015. This year, as last year, the UPCSA resolved that October would be a “month of mission”. Part of the Month of Mission is that daily devotions on the month’s daily readings would be published by different ministers in the denomination. For the first ten days we’ll reflect on the significance of the message of mission. Here’s the first devotion – we hope you enjoy the month’s reflections and pray that they inspire, encourage and edify you. The Mission and Discipleship Committee. 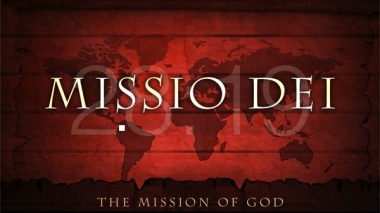 At the heart of the Christian’s Mission and the Church’s Mission is the idea of Missio Dei (Latin for “the mission of God”.) The Mission of God is to reclaim and rescue a world lost and broken by sin. God started Mission when He walked in the garden asking Adam and Eve where they were. This mission continued when He called Abram and blessed him to be a blessing. It intensified when revealed His nature and character to Moses and the Israelites in the giving of the Law, when He commissioned a temple that the nations could come to and when He promised Jeremiah that hearts of stone could become hearts of flesh. God’s mission was em-body-ied when Jesus the Son took on flesh and inhabited Mary’s womb, lived in our broken world and died on the cross where He conquered sin, death and hell. God’s mission is Good News – That’s what the word “Gospel” means. The Good News is that God is reaching for us and that He is mighty to save. We don’t have to be ashamed of the Gospel – it’s Good News that was not a product of our imagination or our effort – it was initiated and concluded by God. This Good News saves. It rescues, redeems, restores, renews, rebuilds and reconciles our broken lives and brings us to God. This Good News is for everyone. There are no boundaries. This Good News is ours when we put our trust in this God who started reaching out for us long before we even thought about Him. It’s a powerful message and I am “proud”(in the sense of worship not ownership) of the message and the God behind it. Theo Groeneveld is husband to Brenda, Dad to Caleb, life-lover, cyclist, computer-geek and minister serving Emmanuel Presby in Pretoria East.